Chrichton's World: Review American Hero (2015): Waste of potential! 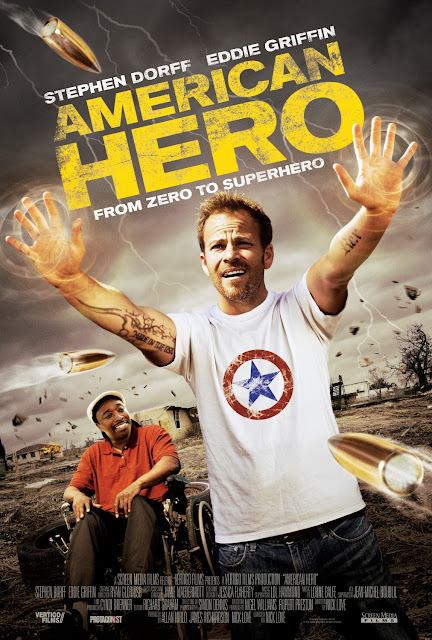 Review American Hero (2015): Waste of potential! American Hero's central theme seems to be about wasting potential. It's rather ironic that the film itself suffers from that what they are accusing our main character Melvin (Stephen Dorff) off. Melvin for some reason has camera's on him all the time. This never gets explained. It's strange but not something that hurts the film. Then we found out one the one reason they are probably following him. Melvin has certain telekinetic abilities. Much later we learn he has more talents but it does not matter much since he doesn't use them to advance himself. And this is the most frustrating part. We are never given a reason why he is not making most of the powers and talents he has. He just wastes his life with drinking, partying while moaning and feeling sorry for himself because his ex wife has made sure he can't see his son. His own son. From what I could tell apart from being a loser he was a good guy and the kid loved him. To deny your son to be in contact with his father in this case is low. I don't understand why mothers do this. It's selfish and has nothing to do with the well being of their child. Anyway so Melvin does deserve a little sympathy concerning that. But then after all he does is saying he will do better or whatever it takes to stay in touch with his kid. And then barely does anything for a long while. It's excuse after excuse not to proceed or follow through. Maybe this is the point. That sometimes you are in such a slump it is hard to get out of it. I would be more sympathetic if Melvin at least kept trying all the time. In this movie he tries one or two times and gives up so very quickly. It infuriated me. Because I know for sure that if I had the abilities and talents he had I would exploit the hell out of them. I thought that this film would show us the making of a super hero. But in the end it's more about the loser becoming a little more responsible. If they had shown us more about why Melvin was so passive and lazy then maybe I would have gotten more out of this. Or if they had shown us him at least trying harder. And what happened to the comedy? Seeing how this was advertised as one there are little to no jokes. Unless you count people almost getting hit with projectiles as something funny. American Hero is a gigantic waste of potential and is not deserving to be viewed. They might have had good intentions. But you don't get anything back from this film for putting in the time and effort to watch this. So avoid!